"Lane splitting" by motorcycle riders may not be safe or completely legal even in California, where the authorities tolerate it -- but it certainly is common there. I saw repeated examples of the technique during a recent visit to Los Angeles. As my pictures show, even this fellow on a big cruising motorcycle with wide handlebars was able to maneuver through traffic. These pictures were made on a congested freeway, but traffic was by no means standing still at the time. I shot the pictures from my seat on the airport bus on the 405 Freeway. Car drivers seemed undisturbed by motorcyclists weaving around them. It seemed to happen too fast for anyone to react at all. At one point I sensed the bus driver edging over to one side of his lane, up against the barrier wall. I expected him to start trading paint with the concrete but there was no contact. It turned out that the bus driver was deliberately making a path for a motorcyclist he could see in his rear view mirror to shoot alongside the other side of the bus into the clear. 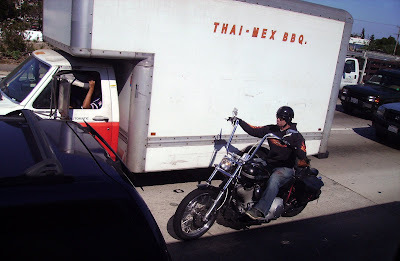 All in all, lane splitting on California freeways shows remarkable skill and tolerance by all concerned. Accidents are said to be rare. I was impressed. But I won't be trying it here in Florida. Even if I had the skill, I would be afraid that it would be seen as "cheating" and discourteous to drivers. Another factor is my Royal Enfield's lack of speed. I wouldn't want to work my way to the front of the pack only to discover that I was holding everyone up! apparently there are studies that suggest it reduces accidents. Also of interest is the study that couldn't find a single accident related to the practice in Australia. I think the wiki article said it all. 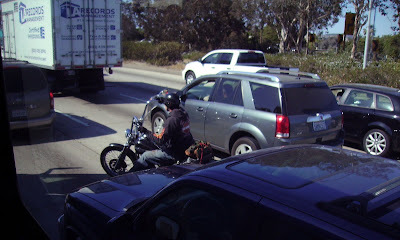 Lane splitting is somewhat dangerous for the motorcycle rider, but it relieves him or her from the other (apparently worse) danger of being directly in front of a moving car on a congested Interstate. It's good that other drivers are OK with it. When I am driving a car and someone slips by me on a bike like that, I white-knuckle the steering wheel, and admit it makes me uncomfortable. As a rider, if I had to choose between getting rear-ended as I rode in the middle of my own lane, or getting knocked over as I rode past a car within two feet of it, or less, I would choose to stay off the Interstate altogether. But I'm a chicken. As someone who wants to be able to ride (the new C5 isn't available in CA)& has numerous friends & family (& pastors & dentists) who ride, I make a make a point of scooting over so the lane-splitter in my mirror can get by. I usually get a wave of thanks in reply. He's happy, I'm happy...& 2 peoples morning commute just got a little less stessful. Works for me! It's standard practice here in the UK. When I lived in clogged up central London it meant that my journey times were 1/2 to 1/3 of car times. Some drivers resent it (very occasionally I've been deliberately blocked); most don't even know you're there until you come past; a few actively make way. Can't say it makes for less risk but it certainly cuts down on frustration levels.